If I had to give Liver 3 a nickname it would be the “Cranky, Irritability, Anger Relieving Point!” This point is by far the best point for calming emotions related to anger and irritability. In Chinese Medicine the Liver channel is responsible for moving energy all directions. When energy gets “stuck” in the Liver channel it then EXPLODES and leads to symptoms such as anger, irritability, PMS, IBS, twitching eyes, and a throbbing headache. I like to teach my patients how to give foot rubs to their family members at home. Who doesn’t love a foot rub, right? 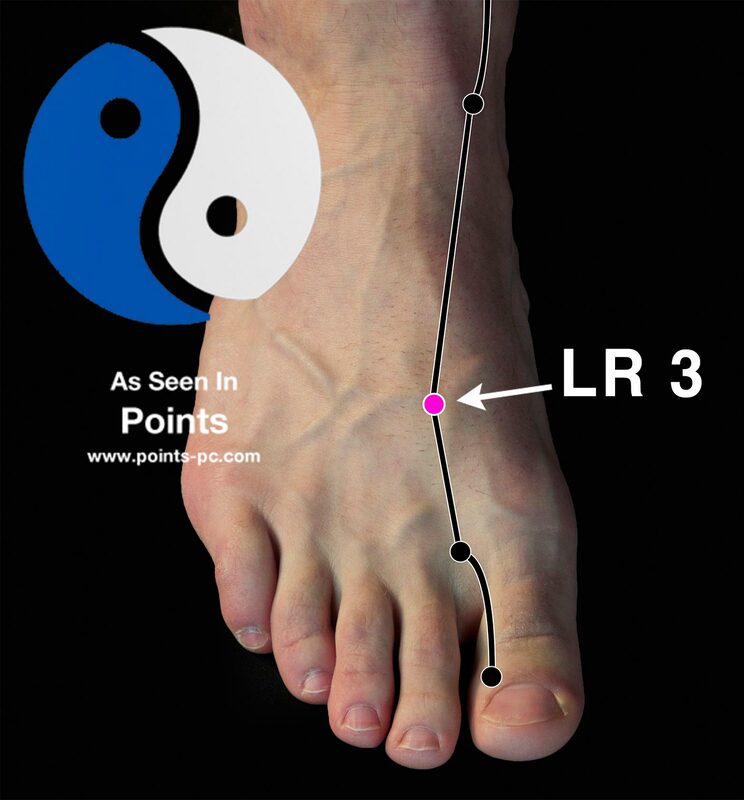 Well, a well-done-relaxing foot rub, with the inclusion of Liver 3, definitely leads to happiness for everyone involved. Spread the word! Liver 3 makes people happy! 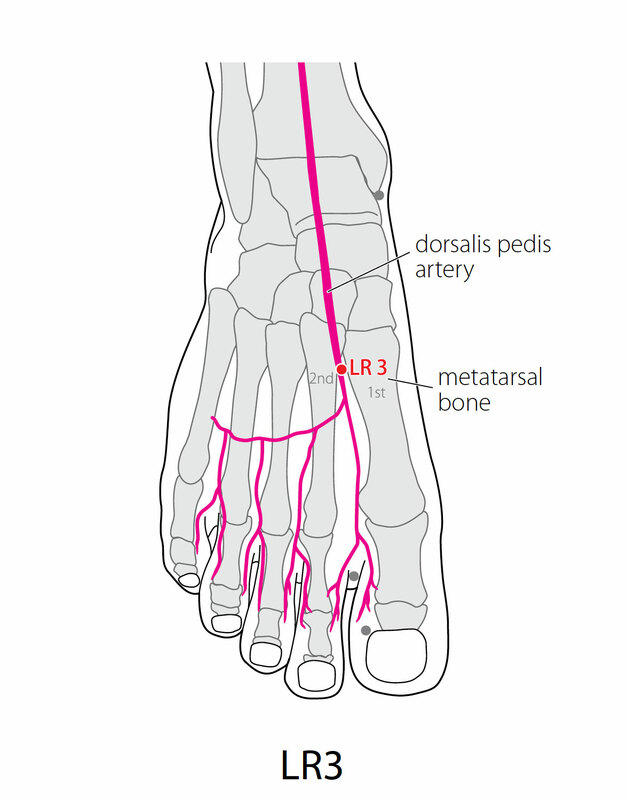 Location: Just distal to the junction of the bases of the 1st and 2nd metatarsals. Attributes: Shu-Stream, Yuan-Source and Earth point of the Liver channel. Ma Dan-yang Heavenly Star point. TCM Actions: Extinguishes liver Fire and clears liver yang; discharges damp-heat in the lower burner; soothes the liver; rectifies qi; courses the connecting vessels and quickens the blood. Indications: Metrorrhagia; hernia; enuresis; urinary stoppage; pain immediately anterior to the medial malleolus; distention ofthe lateral costal region; wryness of the mouth; infantile fright wind; epilepsy patterns; headache; dizziness; insomnia. Secondary Indications: Genital pain; genital retraction; saber and pearl-string lumps; fright wind; swill diarrhea; sore throat; dryness of the upper esophageal opening; lateral knee pain; weakness and aching in the lower leg; red, painful eyes; lumbar pain; lower abdominal fullness; pain in the umbilical region; cold feet; difficult evacuation; jaundice; thunderous rumbling in the abdomen; counterflow retching with no food intake; strangury; vacuity taxation edema; profuse, incessant postpartum perspiration; absence of menstruation.